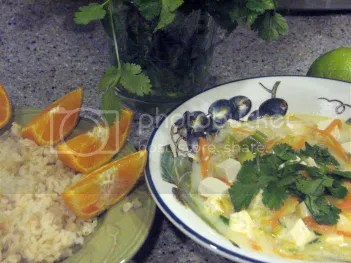 Another version of Thai Coconut Soup, with the cilantro chopped fresh and sprinkled on at the end! Yesterday’s post described my big ski adventure to a hut deep in the Colorado mountains. Being light years from the nearest grocery didn’t keep us from enjoying great cuisine, from potato-broccoli fondue to a hash brown scramble and apple crisp, to the Thai Coconut Soup that provoked yesterday’s post on the “Good to Better Continuum.” In case you’re now hankering for Thai cuisine, here’s my recipe for a shrimp version, although tofu can easily be subbed for a vegetarian take. Place noodles in a small mixing bowl and cover with boiling water. Set aside for about 10 minutes. 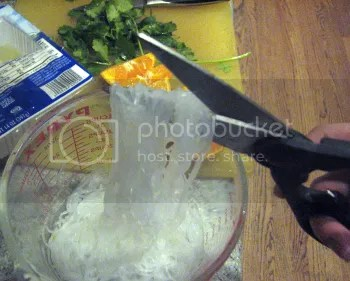 After noodles have softened, drain in colander, then use kitchen shears to cut roughly into 2-3” lengths. Reserve. Heat oil in a large soup pan until fairly hot. Add carrots,onions or leeks, garlic, ginger and chili flakes, in that order, sautéing about 5 minutes total. Add to vegetable mixture and simmer just 5 more minutes, until carrots and leeks are crisp tender but still vibrantly colored. Soak a wad of mung bean threads in boiled water . 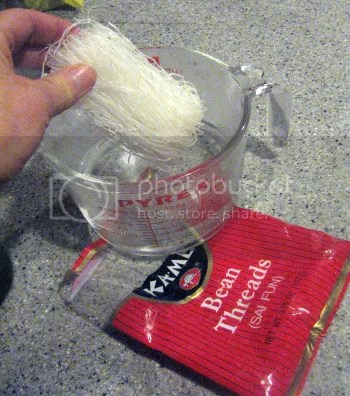 . .
Mung Bean Threads? Way cool noodles made out of mung beans, so they’re ok for Gluten-Free folks. But kids really like them, too, because they’re so very kid-like. They start out as a wad of crackly white sticks but after just 10 minutes of soaking in boiled water, presto, they become soft, gelatinous noodles, great in Asian style soups, stir fries and lettuce wraps. I cut them for better mouth manageability, but they can be left long for slurping. Be Prepared for Speed This recipe is truly fast, so fast, in fact, that it’s advisable to have all your ingredients prepared and ready to go before beginning to cook. Also have any side dishes either already, or almost all prepared. It’s important that the soup not get overcooked or it will lose color and freshness. and they turn into clearish, tender noodles. Roasted winter squash: acorn, butternut, delicata, etc. Words to the wise: start small with seasonings, since you can always add more but can’t take away! You might even experiment with a small amount in a bowl before adding it to the entire pot of soup.